As we get older, "expression lines" and crow's feet around our eyes and mouth become permanent signs of aging. The secret to minimizing these lines effectively is to instantly tighten and smooth the skin while actively treating over time. 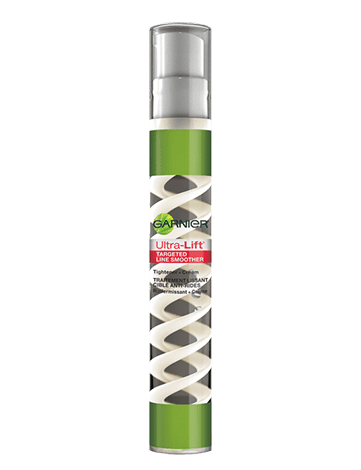 Ultra-Lift introduces a 2-in-1 targeted wrinkle, anti-aging skin care innovation - tightening serum plus anti-wrinkle cream - that effectively smoothes expression lines in targeted areas, such as crow's feet and fine lines around the mouth and forehead. The swirl suspension technology delivers maximum precision, comfort and effectiveness. - Smooth and firm complexion for a renewed look and feel. Apply to complexion twice daily directly on all expression lines & wrinkles: crow's feet, around the eyes, under eyes, vertical lines around mouth and brow furrows on the forehead. This anti-aging treatment Can be used under moisturizer, such as Ultra-Lift 2-in-1 Wrinkle Reducer, or under makeup. Allow to dry. Use daily under moisturizer, such as Ultra-Lift 2-in-1 Wrinkle Reducer Serum + Cream. Rated 4 out of 5 by PMcC from So far so good.. I recently purchased this product, and so far so good. My skin is very sensitive, and many (more expensive) products I've tried either appear to make my skin appear worse, or cause breakouts. This does neither. I'll give it a higher rating if over time I see the neck/jowl lift in a bottle that I'm searching for (ha). Rated 3 out of 5 by Jan202 from Good product - Bad dispenser I am pleased with the product but twice now the pump that dispenses it stopped working. The first time, I had used about half of the product and this time it stopped with about one third of the product left in the bottle with no way to open the bottle to get it out. The first time I thought it was a fluke, the second time, I am really disappointed. Rated 3 out of 5 by Gin111 from Good Product,TERRIBLE Packaging! I'm on my 4th bottle of this serum.It's pretty good,though not as effective on vertical lip lines as I'd like. My main complaint is the bottle.It's constantly falling over,knocking over everything else on the shelf,but even worse as the product is used.As the serum is dispensed from the bottom up,it gets top-heavy! Come on,Garnier,you can come up with a better design then this! My sister,who also tried this,has the same problem. I'm surprised no one else has mentioned this.Please redesign! Rated 1 out of 5 by bamapmw from Ultra lift intesive deep wrinkle day cream I would like to say that the ultra lift intensive deep wrinkle day cream that I purchased did not come in a container as in the picture above!!!! The one that I purchased says that on the front of it...that is why I purchased it. After I got home and went to use I noticed on the back that it says that its purpose is "sunscreen"!!! I would like to know which is it!!! A wrinkle day cream or a sunscreen??? The label is misleading and I feel I did not get what I thought I was getting!!! Rated 5 out of 5 by LMStoryteller from I cant stop touching my face!!! This product works wonders. It makes my skin SO soft that i cant stop touching my face. No need for a face primer, using this it make my makeup glide right on! Wrinkles are gone! I LOVE THIS PRODUCT! Rated 2 out of 5 by Maria53 from This product has an appealing size and packaging with an affordable price point. I am no stranger to Garnier's Products...hair care and skin care. Over the past ten years the product choices proved to be effective at an affordable price point. Just yesterday I purchased four products from the skin line; including the 'deep wrinkle day moisturizer'. Unfortunately, I couldn't tolerate the smell; but, I Love, love, love the results of the other three. My skin looks clean, feels clean and smooth to touch as well. I will recommend Garnier Products to family and friends. Thanks Garnier. Rated 5 out of 5 by liselover21 from great product I noticed a visible difference after the 1st week. Amazing product. I would highly recommend this product.